Subject: How to define a toolbox for adding frequently used commands ? Toolbox provides a special window from which you can run, view, and administer macros. Up to 24 macros can be assigned to the Toolbox window and you can define any number of macro-sets that can be called into Toolbox. The Toolbox window can also be repositioned. This is particularly useful when recording macros because you need to make all Toolbox commands visible. You can also put this input_toolbox command the customize.m file, if you want to start "Drafting" with this toolbox permanently. 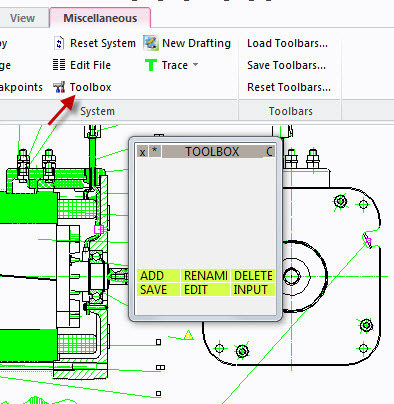 At the Ribbon UI, Toolbox is found at the tab "Miscellaneous" and group "System"